Click on the images to and right click to save. Print quantities of 20 million or less are highlighted in yellow. I've not been able to post much about United States postal stamp this year. It was a busy year with some unplanned travel and work, but given the regular and detailed updates on usps.com, Linn's and APS, collectors are always able to find the relevant information, unlike India Post stamps. 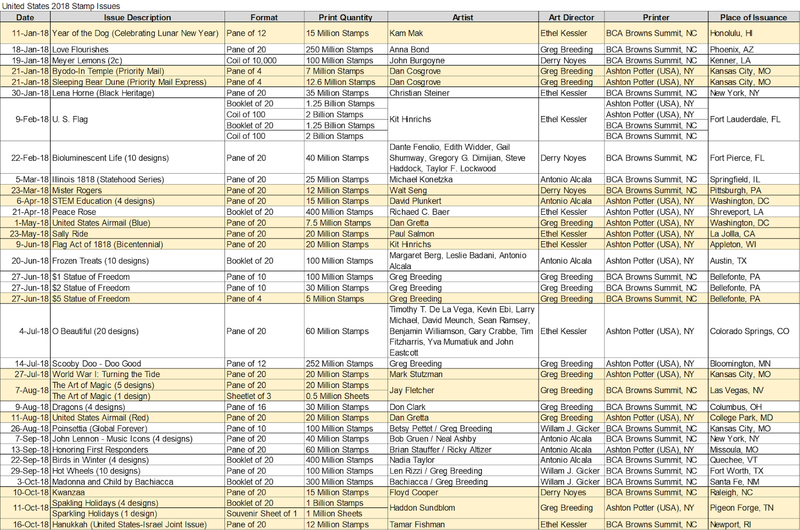 I'm posting print quantities and stamp artist details for all stamps issued in 2018 in the table below. I've noticed that over the last few years the number of stamps with less than 20 million print run has increased a lot, likely reflecting reduced use of stamps and mail. Surprisingly there was no postal stationary released and a butterfly stamp that was previewed last year was not issued this year either. Has that series ended? We'll have to wait to hear from the post office for more details. Let me know in the comments below if anything is missing or you'd like to see something else posted on here. Other than Russia, South Africa and Iran, France is the only other country to have issued two or more joint stamp issues with India. 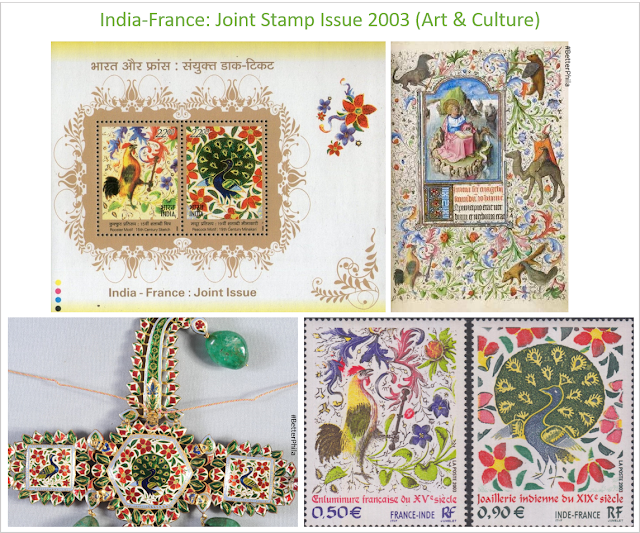 The joint issue in 2003 (released on 29th November) showed identical designs, one each from India and France. India's national bird peacock and a rooster from France were selected to be shown on the stamps. The stamps were considered to deliver a message of renewal through these significant birds and the artwork in myriad of colors. I've been searching for the source of these designs for a couple of weeks, but I've finally managed to get accurate information for both the stamp images. The stamp from France depicts a 15th century artwork in the Book of Hours (Heures a l'usage de Rome in French) created in Provence, France. Two artists, Barthelemy d'Eyck (also known as the Master of the Annunciation of Aix-en-Provence) and Enguerrand Quarton (1410-1466) illustrated this book consisting of 225 leaves, 10 large miniatures and 24 calendar illustrations. Book of Hours is Christian prayer book that was particularly popular in the middle ages. This French Book of Hours contains several illustrations showing months and zodiac signs. The rooster depicted on the stamp was likely done by d'Eyck. This book is currently in Morgan Library's collection in New York City. See an image of the page from this book below. The stamp design from India shows peacock from the back of a 19th century Sarpech jewelry (turban ornament). This handmade sarpech used gold and precious stones done in an intricate art form called Minakari. Minakari was developed and promoted during the Mughal emperor Shah Jahan's rule, and used gems and precious stones, and enamels to make jewelry, royal thrones etc. Minakari is still used to make jewelry, especially in Jaipur and uses flowers, plants, and animal forms as the main design elements. The sarpech shown on the stamp is likely a 19th century piece from Rajasthan, which consists of three clusters, a hexagonal center piece and two rectangular pieces, each showing chrysanthemum flowers and a peacock. Indian stamp was designed by Kamleshwar Singh and was printed in sheetlets of 8 se-tenant pairs along with miniature sheets containing both the stamps. La Poste of France printed individual stamps in sheets of 30 each, which were designed by Claude Jumelet. I've seen the date of issue in France shown as 01st December, but that's the general sale date, and the first day issue date remains the same in both the countries. After 12 years of the first collaboration, India and France celebrated 50 years of cooperation in space science by issuing another joint stamp. The stamps, again one from each country, showed two satellites - Megha-Tropiques and SARAL, on one stamp each. India's space agency ISRO and France's CNES have cooperated in space research since an early agreement in 1964 to build and launch sounding rockets in India. Increased cooperation eventually led to launch of the Megha-Tropiques satellite in 2011 and SARAL in 2013. Megha-Tropiques launched in October 2011 was intended to study water cycle and energy exchanges in the tropics. The satellite is expected to provide insight into the contribution of the water cycle to the tropical atmosphere. The main aim appears to be to understand life cycle of convective systems that influence tropical climate and their role in energy and moisture budget of the atmosphere in the tropical regions. SARAL or the Satellite with ARgos and ALtika payloads was launched in February 2013 to study ocean circulation and sea surface elevation. The two main payloads were built by CNES along with one from ISRO. The satellite launched using ISROs' PSLV rocket will help in marine meteorology, climate and environmental monitoring, sea state and seasonal forecasting, oceanography, earth systems and climate research and protection of biodiversity and maritime security. France's La Poste printed individual stamps in sheets of 42 each. Like most other joint issued in France, La Poste put a presentation pack for sale along with two types of pre-stamped envelopes and a brochure with cancelled stamps from both countries. India Post printed the stamps in individual sheets with 45 stamps in each sheet along with a miniature sheet with both the stamps. Sankha Samanta designed the stamp showing SARAL satellite and David Ducros of France did the artwork for the stamp showing Megha-Tropiques satellite. These stamps were issued at an event on 10th April 2015 when the Prime Minister of India traveled to France for an official visit. If you found this to be an interesting read, do leave comments or suggestions below.